MSP-based Delta flight attendants gear up to vote “yes” to joining the IAM during a meet-and-greet event in Bloomington last month. For many of the 1,800 Delta flight attendants based at Minneapolis-St. Paul International Airport, the upcoming vote to form a union is about more than wages, benefits and work rules. It’s about getting back what they lost after Delta’s merger with MSP-based Northwest Airlines four years ago. Rustad is not alone. At a “meet-and-greet” event hosted in Bloomington last week by the International Association of Machinists, the union vying to represent flight attendants, Rustad and other veterans of Northwest talked about what losing their union meant – and what they stand to gain in the upcoming election. Robert Clark remembered hearing the announcement four years ago, in the wake of Delta’s acquisition of Northwest, that flight attendants at the newly organized company had voted to reject union representation. Northwest workers had been members of the Association of Flight Attendants-CWA. Clark, who lives in Eagan, has worked as a flight attendant out of MSP for the last 15 years. It’s a career path that would have fizzled early, he said, if it weren’t for his union. 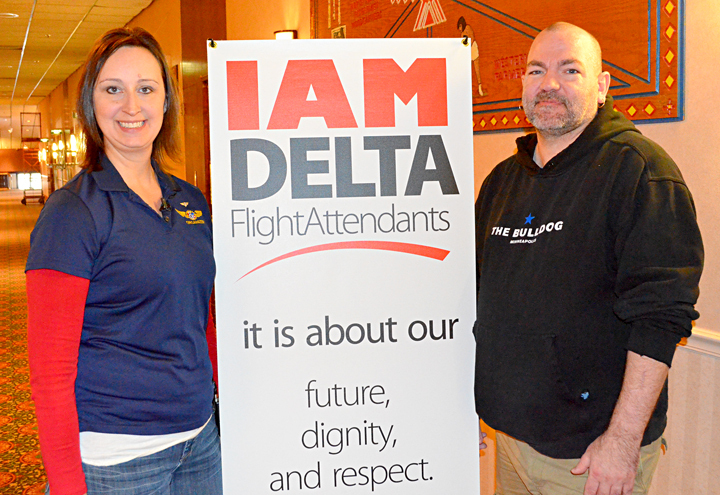 Tammy Rustad, a flight attendant from St. Paul, and Robert Clark, a flight attendant from Eagan, attended the IAM meet-and-greet last week. Burnsville resident Laurie Gandrud, a 20-year veteran flight attendant, was quick to itemize flight attendants’ losses in the transition from union Northwest to non-union Delta, from safety provisions and grievance procedures to retiree health insurance and pensions. Gandrud’s passion and enthusiasm is reflective of the grassroots organizing effort, begun just over two years ago. One flight attendant at a time, union activists collected signatures on 12,000 cards – from 60 percent of all Delta flight attendants – asking the National Mediation Board to conduct an organizing election. Rustad, who was part of a delegation that delivered the 12,000 cards to the NMB in Washington D.C., called the organizing effort a “large accomplishment,” especially given that flight attendants don’t share a common worksite. “These are people most of us have never met or seen face to face,” she said. Industry leader, or industry standard? Flight attendants at the meet-and-greet reported that anti-union mailings already have begun arriving in their mailboxes, as Delta attempts to discourage the organizing campaign. But Angie Brewer, a 25-year veteran of Delta, said the co-workers she talks to are not likely to change course. Most Delta flight attendants, Brewer said, see disparities between their wages, benefits and work rules and those of flight attendants at other airlines – and they look to collective bargaining as the equalizer. “We’re the No. 1 airline, and I believe that,” Brewer said. “We outrank all the other airlines in terms of passenger service and customer satisfaction. We have been turning huge annual profits. Other workers at Delta – notably the pilots, who enjoy better work rules and sick leave than flight attendants – have used collective bargaining to improve their working conditions, and Rustad anticipates the flight attendants’ vote will be the first in a wave of union victories at the Atlanta-based carrier. “When we do win the vote, I expect Delta will be at the negotiating table, ready to go,” Rustad said.